Showing 16 articles from March 16, 2014. The Morgan Arts Centre will be hosting theVernal Equinox Art Fair Saturday and Sunday, from 10 a.m. to 5 p.m. Many local artists will be featured, and a special live music presentation will take place Sunday from 7 to 10 p.m. Refreshments will also be available. For more information, call (360) 864-4ART or visit www.MorganArtsCentre.com. In a crowd-pleasing annual tradition, Toledo High School senior Pascal House was crowed "Mr. T" during a mock beauty pageant on March 12. Begun in 2010 by theater instructor Ron Gaul, the title of Mr. T is available to senior boys who believe they can best woo the judges with their charisma, talents and hopes for the future. The Toledo Parent Teacher Organization (PTO) hit the ball out of the park, according to attendees, with their Family Reading Night March 12 at Toledo Elementary School. Though other such events had been held in years past, most visitors were saying they have never seen one with such scale and volume of activities for kids. It's time to get out and either enjoy the gorgeous bike/walking path along the river, while watching the boats pass by, or just stroll, bike, or drive around the area, and soak in the beauty that many locals have provided for you - in our all of our Parks and the Sports Complex, as well as that fantastic people watching spot, the Boat Launch. You may even "hitch" a ride, like I did, with one of our avid fisherman and see our city from the water...or let's get out our water toys and enjoy the fun...still just $5.00 to launch a boat. The locals that give their time and expertise have joined together through many organizations that interface with our City Teams to implement a GROUP VISION that gives all of us a - ONE OF A KIND - experience to enjoy, and I hope that you thank them for making CR a destination that Visitors don't take for granted, as they visit, and we shouldn't either. It’s official! Ryderwood’s Spring Craft Fair will take place during Mother’s Day weekend, May 9 & 10. While Ryderwood has held Craft Fairs for nearly 10 years, the Spring Fair skipped a year so we don’t call it "Annual". Let’s just say, it’s time to "Spring into Summer" and there will be a wide variety of Mother’s Day gifts to choose from. Interested vendors should contact Marty at (360) 295-0096 for information and to get an application. The fair features only hand-crafted, hand-made or home-grown items. Back by popular demand, will be Jan’s Brown-Sugar Meatloaf at Friday’s Café dinner. Make your reservations early, because it’s almost always a full house for this meal. The price is $8 each and includes everything from salad to dessert. Beverage, too! And no sales tax! Contact Linda @ (360) 295-0875 by Wednesday to make reservations. Tickets are also available before Tuesday’s Nutrition Lunch meal. Oops! Evening with Elvis and Fire Department CPR/First Aid class was Saturday, not Friday. My apologies for these errors. Tuesday BIG Community Meeting 7 p.m. at Toledo Middle School includes a Timberland Regional Library representative to answer questions about the future of TRL in Toledo. Results of Vision:Toledo’s recent survey will be available, as well as local organization spokespersons. Your feedback steers Toledo’s future. Where do you want to go next? I received a call from TOPS (Take off Pounds Sensibly) and they have a member of KOPS (Kept off Pounds Sensibly) for 20 years. Her name is Kay Johnson and she has been successful in keeping her weight off, what incredible will power she must have. TOPS meet every Wednesday at 10:15 a.m. at the Winlock Assembly of God, behind the Chapel. If you would like to join, feel free to call Louva Wood at (360) 262-9612. My interview this week is with a well-known Winlock figure, Coach Mike Voie. This is another interview I will be doing in two parts. Mike coaches Winlock’s football team, and I hope you enjoy the interview as much as I have. Daniel E. House Sr., of Toledo, died March 11 2014. Born Sept. 7, 1950, he was 63 years old. Dan was preceded in death by his parents, LB and Ellen House, and brothers Richard and Donny House. The Vader City Council has decided they will step up efforts to reach out to community members in light of recent accusations of corruption in City Hall by former council members. Mayor Ken Smith told officials during Thursday night’s meeting it is his desire to bring back the regular newsletter Vader used to publish during his first term in office, stating he felt the current concerns among residents signal it is time to re-examine such options. 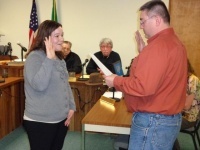 The Winlock City Council has appointed political newcomer Sarah Gifford to fill the seat vacated when former council member Denise Green resigned Feb. 11. A 25-year resident of the city and para-educator for Winlock Middle School, Gifford had been considered for appointment March 10 among applicants such as former mayor Don Bradshaw, former mayor Glen Cook, and Green herself, who had applied for her old position shortly after resigning. Toledo Senior Kreed Askin spent his last days as a high school athlete at the WIAA Basketball Hardwood Classic in Yakima last weekend, but what a ride it was! The Toledo boys basketball team took 6th place at the tournament and Askin was a key part of that trophy. Askin is one of two seniors on this year's Toledo basketball team. Last year, the Indian's graduated seven and on paper, only Jacob Andrews was set to be a senior on this year's team. Another car theft has been reported in Vader, this time on the 900 block of D St., according to the Lewis County Sheriff’s Office. Deputies were contacted Saturday by the 50-year-old male victim who said someone had stolen his 1993 Honda Prelude since the night before. It was noted the vehicle had been locked and there were no signs of forced entry. Local EMS and fire calls between March 10 and March 16. A Winlock woman was sentenced to mandatory parenting classes after pleading guilty to conspiracy to commit third-degree assault in Lewis County Superior Court Thursday. Heather L. McNurlin, 23, had been arrested Jan. 22 after allegedly allowing her boyfriend, Ryon T. Connery, 31, to physically and mentally abuse McNurlin’s 4-year-old son for offences such as taking food without permission and wetting his pants. Don’t lose your pot of gold is the message that the Washington State Patrol (WSP) and other local law enforcement agencies around Southwest Washington are sending. St. Patrick’s Day may be a time to celebrate with family and friends, but your holiday plans should also include transportation to and from your destination if you plan to drink. Getting a Driving-Under the Influence conviction is expensive. First time offenders can expect to pay an average cost of $10,000. By the time bail, fines, fees and insurance are paid; the costs could be more. Don’t forget about time lost at work and the toll it will take on those in your life.